Ensuring that the right people have the right access and are doing the right things across a complex enterprise can be a daunting challenge. Where do you actually begin and how, in today’s environment, can you possibly get it funded? 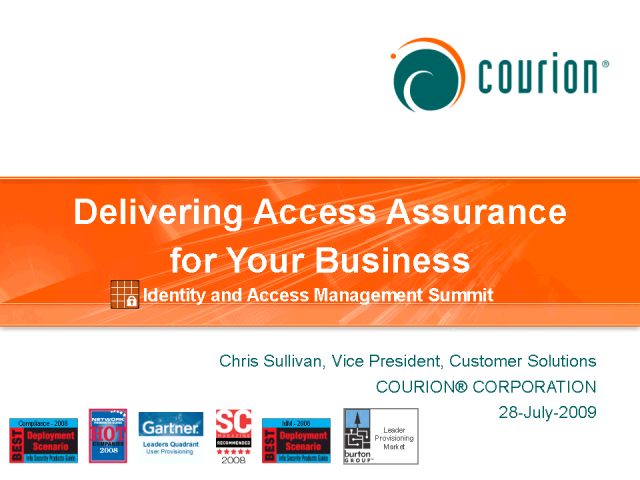 This presentation will help you develop an access assurance strategy and supporting business case that will enhance security, improve compliance and save money. -Level setting – What is access governance and how does it add value to the business. -Defining goals – Establishing business goals and timeframes. -Developing a roadmap – Creating an actionable plan that charts how to get from where you are to where you need to be within your business and technical constraints. -Developing a business case - Tips and techniques for finding the funding in today’s environment.